What a blessing to be with you this morning! I bring greetings from Massachusetts, where I serve as “Missioner for Creation Care” for the Episcopal Diocese of Western Massachusetts and for the United Church of Christ. In this ecumenical role I travel from place to place, preaching the Gospel and speaking about our call as Christians to love and protect the Earth that God entrusted to our care. Imagine my pleasure when several weeks ago I received an invitation from your rector to preach at St. James. 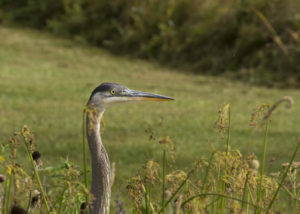 He told me about the steps you’ve been taking to care for God’s Creation. I hear that you’re working to improve your building’s energy efficiency and moving toward installing solar panels; that you hosted a public forum on wind power; and that last month your Vestry decided – unanimously! 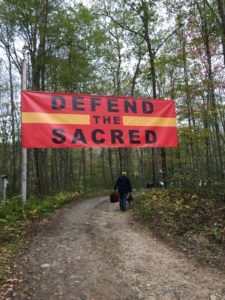 – to divest from fossil fuels, making St. James the first congregation in this diocese to divest. I am deeply thankful that you are setting out on a path to live more lightly on the Earth and following Jesus on the Way of Love. Faith communities have a special role to play in healing what one of our Eucharistic prayers calls “this fragile Earth, our island home.” The world needs our witness more than ever. Scientists are telling us with increasing concern that the web of life is unraveling before our eyes. Great populations of creatures – even entire species – have vanished. Last fall, World Wildlife Fund released a major report showing that the number of animals around the world has plummeted by over half in less than 50 years. Human beings have wiped out 60% of the world’s mammals, reptiles, amphibians, birds, and fish since 1970. According to this new study, the vast and growing consumption “of food and resources by the global [human] population is destroying the web of life, billions of years in the making, upon which … society ultimately depends for clean air, water and everything else.” One expert commented: “This is far more than just being about losing the wonders of nature, desperately sad though that is…This is actually now jeopardizing the future of people. Nature is not a ‘nice to have’ – it is our life-support system.” You’ve probably heard that we are in the midst of the world’s sixth extinction event – “the sixth time in world history that a large number of species have disappeared in unusually rapid succession, caused this time not by asteroids or ice ages but by humans.” Alarmed scientists are describing what they call a “biological annihilation.” Related to species extinction is our changing climate. Because of the relentless burning of coal, gas, and oil, month after month our planet is breaking records for heat. The New York Times recently reported that “the five warmest years in recorded history were the last five, and…[that] 18 of the 19 warmest years have occurred since 2001.” New studies show that the oceans are also breaking records for heat and heating much more rapidly than many scientists had expected, with drastic effects on marine life, coral reefs, and sea-level rise. Sea ice is melting. Land ice is melting. Tundra is thawing. Extreme storms are growing more intense. The U.N.’s Intergovernmental Panel on Climate Change reports that we have only a very short span of time – maybe 12 years – in which to avert a catastrophic level of global warming. I think it’s fair to say that in these precarious times, many of us, for good reason, may be feeling stressed-out, or numb, or, frankly, scared. This is a good time to sink our roots deep into the love of God, to remember how loved we are, how cherished we are in God’s sight, how nourished we are by a love that will never let us go and that will give us strength for the journey ahead. So thank God for St. James! Thank God for every community, every congregation, every house of worship that draws people together to pray, to listen to the wisdom of Scripture, to draw close to Jesus, and to be strengthened by the Holy Spirit! Today’s readings give us a beautiful image for spiritual resilience and leadership. In Psalm 1 we read that those who trust in God are “like trees planted by streams of water, bearing fruit in due season, with leaves that do not wither” (Psalm 1:3). Imagine being such a tree! Your roots go deep into the love of God, which runs like a river beside you. No matter what is happening in the world around you, even if what’s going on is dangerous or chaotic, even in times of storm or drought, your roots reach deep into the ground and you stand beside a divine river that is endlessly flowing. Like trees planted beside a stream of living water (John 7:37-38), we are “rooted and grounded in love” (Ephesians 3:17). We know that God is with us. We feel God’s power and we feel God’s strength. Drawing from those deep roots we rise up like trees, bearing fruit in due season, with leaves that do not wither. We drink deep of abundance, absorb it into every cell of our bodies, and then share that abundance with the world – freely, generously, without holding back, because there is plenty more where that came from! The same image of spiritual resilience and vitality plays out in today’s reading from the prophet Jeremiah (Jeremiah 17:7-8): 7 Blessed are those who trust in the Lord, whose trust is the Lord. 8 They shall be like a tree planted by water, sending out its roots by the stream. It shall not fear when heat comes, and its leaves shall stay green; in the year of drought it is not anxious, and it does not cease to bear fruit. I find this tree imagery so compelling that it affected the title of a book I’m co-editing that will be published (by Rowman & Littlefield) this fall, Rooted and Rising: Voices of Courage in a Time of Climate Crisis. The manuscript is due in 10 days – so, in more ways than one, the heat is on. With my co-editor, Leah Schade, we’ve put together a collection of essays by 21 climate activists from a range of faith traditions, asking each of them to write about what gives them the energy, motivation, and courage to keep pushing for a more just and healthy future, when the odds of success are so slim and the forces arrayed against us are so great. 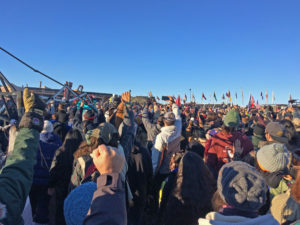 In one way or another, each of these dedicated activists has sunk their taproot into something enduring that grounds them, like trees extending their roots into deep soil. I’m not a biologist, but I’m learning that trees are more intelligent than we thought. 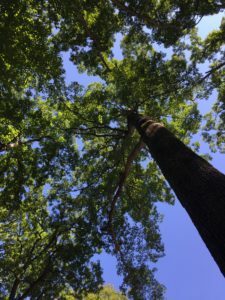 Books like The Hidden Life of Trees tell us that the root systems of trees communicate with each other, and that trees develop social networks and share resources. A lot of underground life is going on beneath our feet! And that’s true for us, too: when we sink our own roots deep into the love of God, we, too, discover that everyone and everything is connected. On the surface, we may see only our differences, what divides us from each other, but from below, on the level of roots, we discover what Martin Luther King, Jr., called the Beloved Community: here, where God’s love is always being poured into our hearts, we realize that everyone, and the whole Creation, is loved and that we belong together. 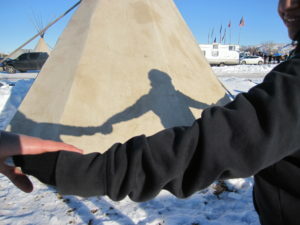 Beneath all our differences of race, class, gender, and political party, we belong to one living, sacred whole. Every time we tap into the deep-down truth of our essential belovedness, we discover fresh energy for life. And so – up we rise, like a mighty tree, offering our gifts to each other and to the world: our fruits and leaves; a kind word, a healing gesture, our resolve to take part in the healing of the world. When it comes to tackling climate change, there is so much that we as individuals can do. Maybe we can plant a tree. Save a tree. Recycle more. Drive less. Eat local, eat organic, eat less meat and move to a plant-based diet. Maybe we can support local farms and land trusts. We can fly less – and, if we must fly, we can buy carbon offsets. Maybe we can afford solar panels and move toward a carbon-neutral home. 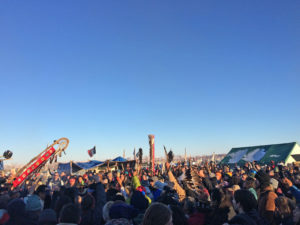 If we have financial investments, we can do what this church did – divest from fossil fuels – and if we’re college graduates, we can urge our alma mater to divest, as well. I’m thrilled to hear that this congregation is invited to take part in a new initiative that The Episcopal Church is launching in Lent: Sustain Island Home. The Diocese of Western Massachusetts will also join Sustain Island Home this Lent. Sustain Island Home1 will help us learn how to reduce our carbon emissions, and it provides a “carbon tracker” that will mark our progress as we make better choices around energy. Learning how to live a carbon-neutral life – learning how to ditch fossil fuels and turn toward energy efficiency, energy conservation, and clean renewable energy – is one of the most powerful and prayerful ways we can align ourselves with the love of God and neighbor. Individual changes make a difference, but because of the scope and speed of the climate crisis, we need more than individual action – we also need systemic change. As the IPCC has made clear, we need to transform our society and economy at a rate and scope that are historically unprecedented. To do that, we need to use our voices and our votes, and to make it politically possible to do what is scientifically necessary. This will not be easy. We will have to root ourselves and plant ourselves in the love and justice of God. A small sign near one of the church’s doors says it all: the building may be vast, grand, and historic, but the church is not a building. We are a movement, a people following Jesus on the Way of Love. 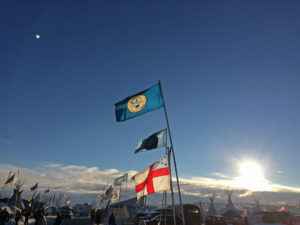 SustainIslandHome.org was piloted by the Episcopal Diocese of California. It will be gradually unrolled in dioceses across The Episcopal Church starting in Lent, 2019, and will reach the whole Church by Earth Day. For more information about SustainIslandHome, visit the “Advocacy for Climate Solutions” page of the Diocese of California: diocal.org/climate. 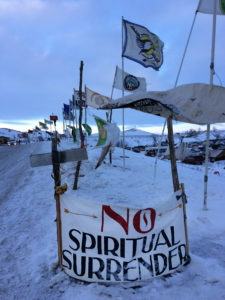 Today’s blog post, which is also on the Bishop’s Blog of the Episcopal Diocese of Western Massachusetts, is co-written by The Rev. 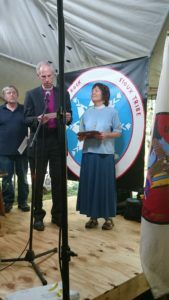 Dr. Margaret Bullitt-Jonas and Bishop Doug Fisher. 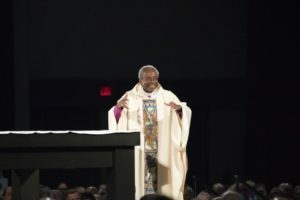 Presiding Bishop Michael Curry is coming to the Diocese of Western Massachusetts on Sunday, October 21, to celebrate an Episcopal revival, with events at 1:00 p.m. in Pittsfield and at 5:00 p.m. in Worcester. Everyone is invited! For more information, visit here. Both revival events will be livestreamed by The Episcopal Church. You can watch the Pittsfield revival livestream here. You can watch the Worcester revival livestream here. Everyone (and we mean everyone) knows our Presiding Bishop Michael Curry as “the Royal Wedding Preacher.” He certainly touched souls around the world in his inspired message of the transforming power of love. But did you know that five days later he participated in a Vigil at the White House? 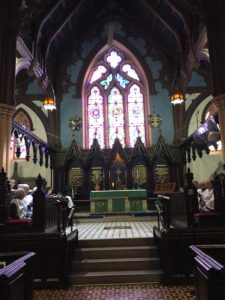 As we gather together this Sunday in Pittsfield and Worcester for an Episcopal revival led by the “oh so much more than a wedding preacher” Michael Curry, let’s look at why this is a time of crisis for God’s creation. The Earth is reeling under many pressures, from an explosive growth in human population and consumption to species extinction, habitat loss, and resource depletion. But our most urgent concern is how human activity is changing the climate. Our fears were confirmed last week when the U.N.’s Intergovernmental Panel on Climate Change (IPCC), the leading international group that assesses climate change, released a major report. The IPCC report was stark: humanity is on the brink of catastrophe. The only way to prevent global temperatures from rising more than 1.5 degree Celsius – the level that countries around the world have agreed is a safe upper limit for maintaining life as we know it on this planet – is for nations to cut their carbon emissions drastically and rapidly. In just over ten years – by 2030 – the world will need to have cut global emissions in half (45 percent below 2010 levels). To hold global temperatures to 1.5 degree Celsius will require rapid and massive transformation of every level of society. For example, the report calls for a total or near-total phase-out of the burning of coal by 2050. The task ahead of us is daunting. The world has already warmed 1 degree Celsius from pre-industrial times, and without a massive global effort, the world will warm by 1.5 degrees in as little as 12 years. If we allow global warming to rise by 2 degrees Celsius – to say nothing of allowing business as usual to continue on its present track, which would raise global temperatures by 3.4 degrees by the end of this century – we will live on a planet that is extremely difficult not only to govern, but even to inhabit. 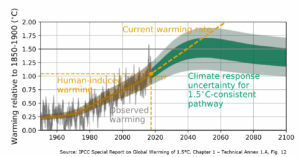 The IPCC report warns that there is “no documented historical precedent” for making the sweeping changes in society that would be required in order to hold global temperatures to 1.5 degrees. Yet if we want to prevent massive crop failures and droughts, extreme storms and sea-level rise, and the migration of millions of refugees, and if we want to pass along a habitable world to our children and our children’s children, we need to tackle climate change. The day of reckoning has come. As St. Paul exhorts, “See, now is the acceptable time; see, now is the day of salvation!” (2 Corinthians 6:2). Today is a good day to put climate denial behind us. Today is a good day to reject the climate denial expressed in White House policies that promote fossil fuels and ignore, downplay, or even accelerate the climate crisis. Today is also a good day to admit our own everyday version of climate denial and to step up our personal efforts to reduce our use of fossil fuels. What next steps can you take? For starters, does your congregation have a “green team” or “Creation care committee”? Whatever you call it, a team of parishioners concerned about climate change can take the lead in educating and organizing its community. You can download an article about how to start a “green team” here. At diocesan convention, delegates will vote on a resolution that asks every congregation to create a green team or liaison. Here’s another idea: how about eating less (or no) meat? A new report confirms that shifting to a plant-based diet is one of the most effective actions we can take to reduce our carbon footprint, limit climate change, and allow the Earth to keep feeding the global population. Michael Curry has made Creation Care one of his three priorities. (Racial Reconciliation and Evangelism are the others.) We have said many times that this Sunday is so much more than great speeches by Michael. It is an opportunity to commit to a revival of our souls, our church, our communities and our world. In a time of crisis, may we passionately recommit to fighting climate change and caring for God’s creation. Margaret’s sermon (October 14, 2018) about the IPCC report, “Ten years to avoid climate catastrophe? What do we do now?” is here. Like many Americans, I have been gripped by news of the disaster now unfolding along our nation’s Gulf Coast. As torrential rains bear down on Texas and Louisiana and the floods swell, people are struggling to survive and struggling to rescue family-members, neighbors, and pets. Stories of tragedy and terror, courage and loss have unfolded all week: trapped in his car, an elderly man is rescued from rising waters by a human chain; swept away in the flood, a mother, carrying her toddler on her back, is found dead, floating face down; the three-year-old girl, still clinging to her mother, is pulled to safety. Stories like these pull us into prayer – grief for those who perished, anguish for those in harm’s way, gratitude for the people saving everyone they can, and a rising tide of anger and resolve: we will not stand idly by as people drown and are dislocated in extreme storms like these. Part of a faithful response is concrete and immediate: if we live nearby and have a boat or clothes to spare, we can offer what we have. Wherever we live, if we have money to spare, we can donate to a disaster relief organization, including faith-rooted groups such as Episcopal Relief and Development and Church World Service. This week, author and social activist Naomi Klein also pointed out that Harvey “didn’t come out the blue”: it was just the kind of extreme weather event that climate scientists have long been predicting. Surely now is the time, she argues, to have a serious policy debate in this country about the host of questions that Harvey raises: What kind of energy should we rely on (a question, she points out, “with jarring implications for the dominant industry in the region being hit hardest: oil and gas”)? What kind of safety net do we need to provide for the poor, the ill, and the elderly, given their vulnerability in times of disaster and given the certainty that storms like Harvey are only a harbinger of the climate-related storms that lie ahead? Climate change has never been only about polar bears. 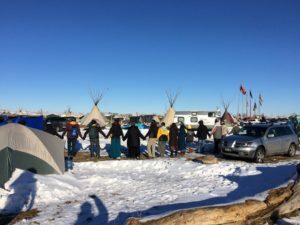 Stabilizing the climate is about social, racial, and economic justice, too – about treating Earth and each other with reverence and respect. How many more floods need to drown or displace our citizens and destroy our homes before we wake up to the climate crisis and take urgent steps to keep fossil fuels in the ground? How many more vulnerable communities are we willing to sacrifice in order to keep dumping greenhouse gases into the atmosphere and keep enriching fossil fuel industry billionaires? Meanwhile, as Harvey brings devastation to our Gulf Coast, a record-breaking strong monsoon season in Southeast Asia has caused over 1200 deaths this summer. Thanks to Harvey, Americans are newly aware of the suffering caused by floods exacerbated by climate change. Perhaps now we can look with greater empathy at similar images coming from India, Nepal, and Bangladesh – images of other mothers wading through flooded areas, carrying their children in their arms; images of other homes destroyed and other communities cut off, with no food and clean water for days. 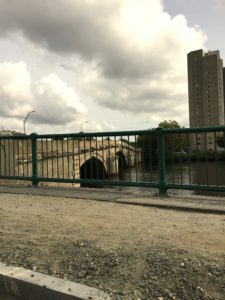 Cambridge, Massachusetts? I was born and grew up there. By the end of the century? I do the arithmetic, figuring the ages of my children and grandchildren. I imagine the social chaos, the streams of refugees, the abandoned buildings. Will we look back on Harvey (and Katrina and Sandy) as the first in a relentless wave of storms that eventually brought down many of America’s great cities? Or will we look back on Harvey as the storm that finally got the attention of the American public and showed us the urgent need to take action on climate? Climate change is neither distant nor abstract. It is real, present, and personal. Our country’s President denies the existence and human causes of climate change, and his environmental policies surely make matters worse, but people of faith, and people of good will, refuse to abandon the Earth entrusted to our care. 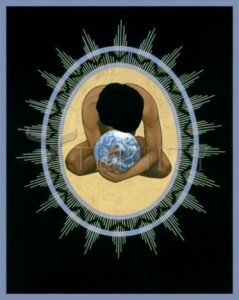 Tomorrow, on September 1, Christians will mark a World Day of Prayer for the Care of Creation. 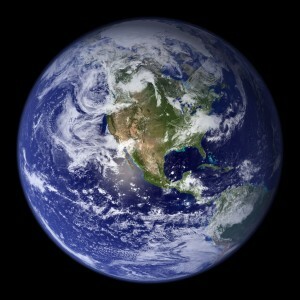 Whatever your faith tradition, I invite you to join in this planet-wide pause to hold our troubled world in our hearts. I invite you to go outside and appreciate the living world around you – the trees, soil, water, birds, and clouds. I invite you to acknowledge your own grief, anger, and fear about the Earth’s unraveling web of life, and I invite you to seek the guidance, resolve, and courage that come from listening to our deepest inner wisdom, the place where Love dwells. 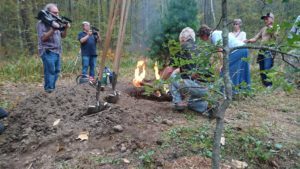 Here in Massachusetts, Episcopal congregations will mark their own Season of Creation, from October 4 through the end of November. 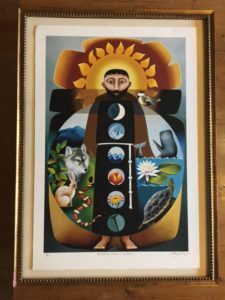 In the Diocese of Western Massachusetts, we have assembled a mass of resources to help individuals and communities of faith to mark Creation Season. 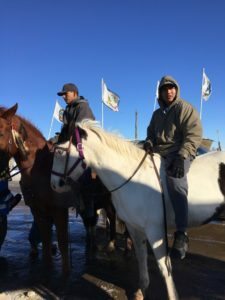 I hope that you will take a look, and decide how you and your community of faith will act, advocate, learn, and pray on behalf of God’s good Earth. How will you celebrate Creation Season this year? 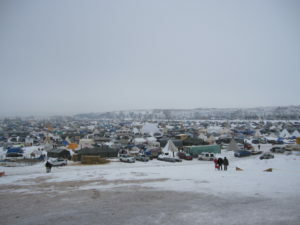 Will you design an outdoor worship service at a place of environmental degradation? Offer prayers to bless solar panels? Preach about the climate crisis? 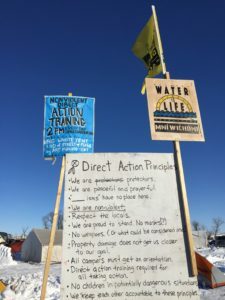 Carry out non-violent civil disobedience to protest a new gas pipeline? Organize a study group? How will the extraordinary suffering and tragedy of Harvey – much of it endured beyond the reach of TV cameras and crew – strengthen your intention to become an agent of healing and hope? An ecumenical statement from Episcopal Diocese of Western Massachusetts and Massachusetts Conference, United Church of Christ, responding to the President’s decision to withdraw from the Paris Climate Accord. To download a pdf, click: An Opportunity for which the Church Was Born. President Trump’s decision to abandon the Paris Climate Accord violates the values and vision that are basic to Christian faith. 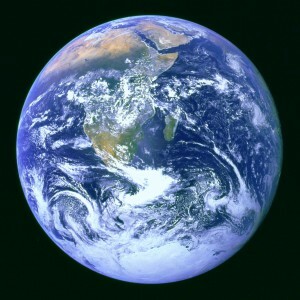 Our Judaeo-Christian heritage teaches that the Earth and its web of life are precious in God’s sight (Genesis 1-2:3), that the Earth belongs not to us but to God (Psalm 24), and that we are entrusted with loving the Earth as God loves it (Genesis 2:15). As followers of Jesus, we are committed to God’s mission of reconciling people with each other and with the whole of creation. Withdrawing from the Paris Climate Accord is a tragic mistake, and we applaud the Parliament of the World’s Religions strong condemnation of the President’s decision. We concur that this decision is scientifically, economically, medically, politically and morally wrong. With heartache we recognize the devastating toll of suffering that will be exacted by this Administration’s refusal to address the climate crisis. We are appalled by the Administration’s unwillingness to join with other nations in protecting and stabilizing the atmosphere upon which our species – and so many other forms of life – depend. Even as we grieve the death-dealing trajectory of this decision, we rejoice that many people and institutions are taking creative steps locally, regionally, and nationally to build a more just and sustainable future. For example, we applaud the mayors of 30 American cities, governors of numerous states and leaders of hundreds of American companies who are committed to reducing greenhouse gas emissions. 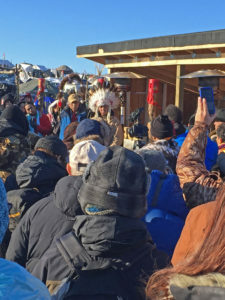 This historic moment provides Christian communities with a powerful opportunity to bear witness to the sacredness of God’s creation and the urgent call to preserve it. This is our chance to be the church. Episcopalians and other members of the Anglican Communion recognize Five Marks of Mission. The Fifth Mark is “to strive to safeguard the integrity of creation and sustain and renew the life of the earth.” The United Church of Christ affirms this vocation in its new mission initiative known as the three great loves, one of which is love of creation. If we listen carefully, the voice of our still-speaking God resounds above the jeers and cheers in response to Trump’s decision. God is calling our congregations and clergy to rise to the occasion and to become bold witnesses to the creative power of God. Now is the time to bear witness to the Christ who rises from the tomb and who proclaims that life and not death will have the last word. generation to protect God’s creation. 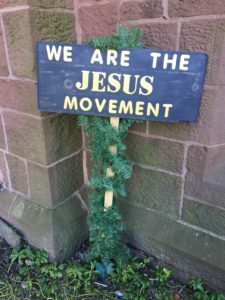 Let the world know that whatever the current American administration may say or do, the Jesus movement will not back away from God’s call to protect our common home. Now is the time for congregations and for every person of faith to set a moral example through our own words and actions. As individuals and as communities, we can commit to making decisions of integrity in our energy choices, and to holding our leaders accountable to do the same. Now is the time for communities of faith to be bold and courageous in proclaiming truth in the public square. 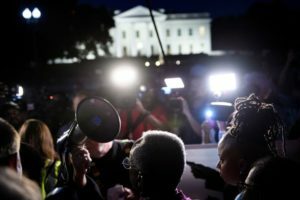 It is now abundantly clear that the Federal Government will not address the greatest moral challenge that the world has ever faced. It is up to us. 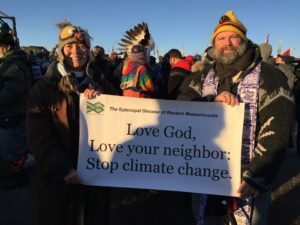 Let us commit to resist all expansion of fossil fuel infrastructure and demand new sources of renewable energy that are accessible to all communities. As people of faith, we can and we must change America’s understanding of the story that our generation is writing. We must begin a new story – a story that is not dependent on fossil fuel or on wealth for the few and misery for the many. 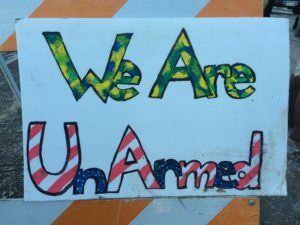 In the streets, at the State House, with our phones and emails, by committing our time, financial resources and prayers – it is up to us – we the people – to bend the moral arc of justice. And we will. This statement sprang from a discussion among The Rev. Dr. Jim Antal (Conference Minister and President, Massachusetts Conference, United Church of Christ), The Rt. Rev. 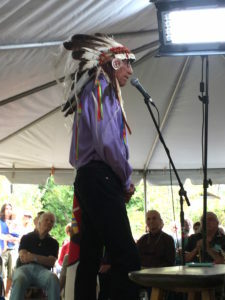 Dr. Douglas John Fisher (Bishop, Episcopal Diocese of Western Massachusetts), and The Rev. 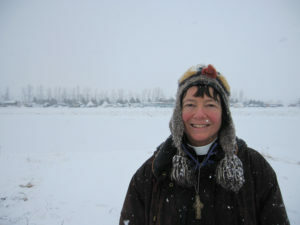 Dr. Margaret Bullitt-Jonas (Missioner for Creation Care, Episcopal Diocese of Western Massachusetts & Massachusetts Conference, United Church of Christ). We are glad to make it available to the wider Church. 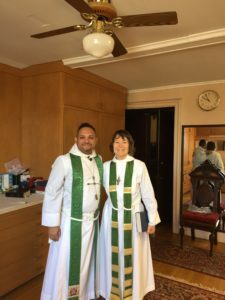 A brief presentation to lay and clergy deputies of the 115th Annual Convention of the Episcopal Diocese of Western Massachusetts, delivered on October 29, 2016. 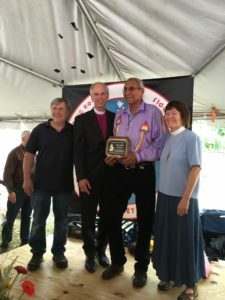 The three missional priorities of The Episcopal Church are evangelism, racial reconciliation, and environmental stewardship. This talk about environmental stewardship in our diocese came after talks on evangelism (by Rev. Nancy Strong) and racial reconciliation (by Rev. Harvey Hill). Thank you for inviting me to say a few words about this ministry. A full report of what I’m up to is available online in your convention materials, so I’ll keep this short. 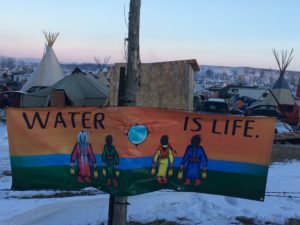 Before I say anything else, I want to thank you for approving just moments ago a resolution to express our diocese’s support of the water protectors at Standing Rock. 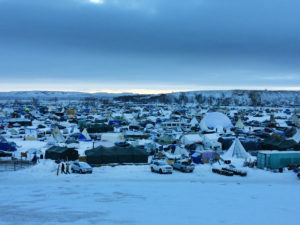 Clergy are being invited to go to North Dakota next week to offer their witness and support, and I just read on Facebook that seven clergy from the Diocese of Massachusetts are planning to make the trip. I hope that some of you will feel moved to join them. Serving as your Missioner for Creation Care has not been boring. Not once. The job challenges me, provokes me, and asks me to be creative and resilient and get out of my comfort zone. It keeps me on my knees, depending on the power of the Holy Spirit, and it keeps me on my feet, heading out to do things I’ve never done before. What calls me to this ministry? On the one hand, I have a deep, sweet sense that God is with us, that God’s love is unfailing and powerful and real, and, on the other, I live with a painful awareness that the web of life is unraveling before our eyes. If we keep burning fossils fuels like coal, gas, and oil at anything like present rates, we will push the global climate to a level of disruption that will render the planet difficult to inhabit, perhaps in the lifetimes of our children. Last year we set a new record for heat, crushing the record set the year before, and this year is right on track to be hotter still, generating extremes of weather, droughts, floods, storms, uncertain seasons for planting and harvest, the spread of infectious diseases, rising and acidifying seas, and more troubles than I care to name. Where do we find the courage to face this new reality and to muster an effective response? What do we do with our anger, fear, and grief? How can our faith in the crucified and risen Christ help us to break out of our inertia and denial and to rise to the occasion, so that we join hands with each other and with other people of good will, and take action? These are questions I tackle every day when I preach at churches, large and small; when I offer workshops; when I speak at rallies and prayer vigils; when I write blog posts and articles; when I lobby; when I lead retreats. 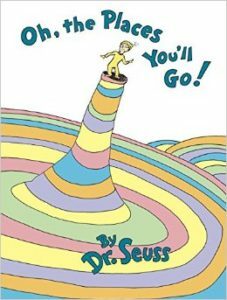 This past year I’ve sometimes felt like the character in that book by Dr. Seuss, Oh, the Places You’ll Go!. I’ve found myself in all kinds of places. 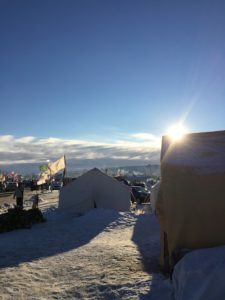 Last December I scrambled onto the back of a pickup truck parked on the Boston Common outside the State House and spoke to more than two thousand people gathered for the biggest climate rally in Boston’s history about the ways that faith can guide our efforts to build a more just and sustainable future. In April, I traveled to Delaware to lead a retreat for the clergy of that diocese. 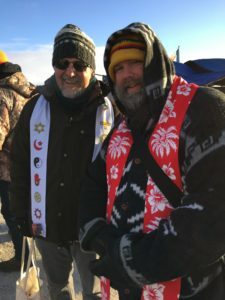 We prayed and talked and wept together, acknowledging our grief about the climate crisis and re-dedicating ourselves to protect God’s Creation. 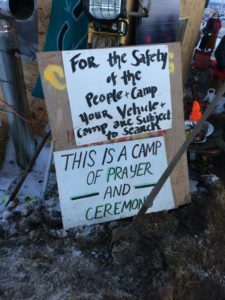 In May, I sat on the edge of a pipeline trench in West Roxbury beside fifteen other clergy from a variety of faith traditions, our legs dangling in the pit, as we sang, prayed, and prepared to be arrested for blocking construction of a dangerous and dirty fracked gas pipeline. In June, along with hundreds of other people, I traveled to Washington, DC, for the annual conference of Citizens Climate Lobby. I spoke on an interfaith panel about the roles that faith communities can play in a time of climate crisis, and I spent a day lobbying members of Congress for a fair and rising price on carbon. 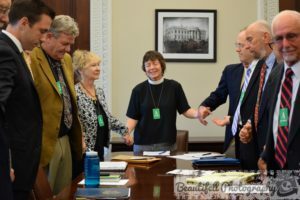 In September I returned to DC to join other members of the National Religious Coalition on Creation Care in a meeting with the White House Council on Environmental Quality. We talked about what climate change is doing to the oceans, and how faith leaders can support the President to take bold steps before he leaves office. When the meeting ended, we stood up and joined hands, and I prayed out loud for the day when the Earth shall be filled with the glory of God, as the waters cover the sea. When you’re on a mission, you never know where God will send you. 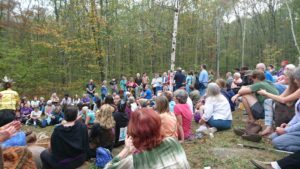 Please mark your calendars and spread the word about an outdoor worship service for Creation care that we’ll hold at Heifer Farm in Rutland, MA on Sunday afternoon, November 13. 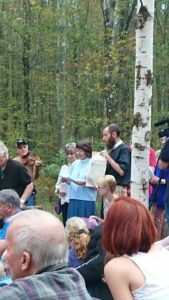 This will be a big, ecumenical, family-friendly outdoor prayer service led by our bishop and by all the other leaders of Protestant denominations in Massachusetts – Episcopal, Lutheran, and UCC. Look for us on Facebook: the event is called “We Are the Earth: Public Prayer for the Planet,” and please let us know you are coming. 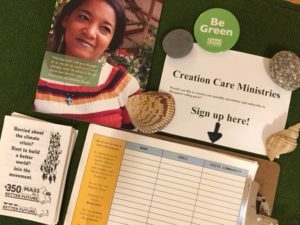 On the table outside you can sign up to join our network of people in the diocese who care about Creation, and you can pick up a handout that lists ways to get involved. 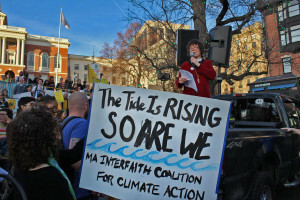 I’m available to preach and speak in your parish, and my Website, Reviving Creation, shares blog posts, sermons, and other stuff, including an article on how faith communities can address the climate crisis. Right now our diocese is in the midst of celebrating our third annual Creation Season, and on our diocesan Website you’ll find lots of updated materials on how to Pray, Learn, Act, and Advocate. Thank you for all the ways you join me in this mission. 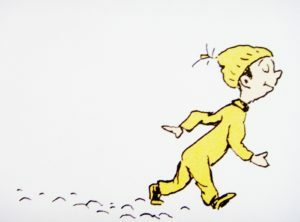 Oh, the places we’ll go!